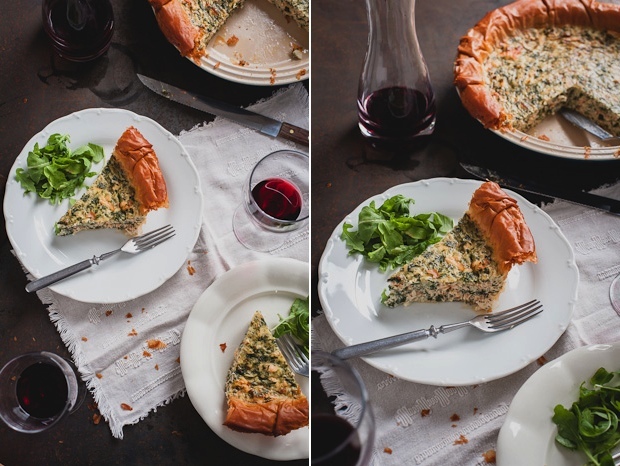 I made this quiche a few weeks ago and it was a big hit in this house. It's so easy and taste great hot or at room temperature. I made the quiche for dinner and we enjoyed leftovers the next day for lunch. 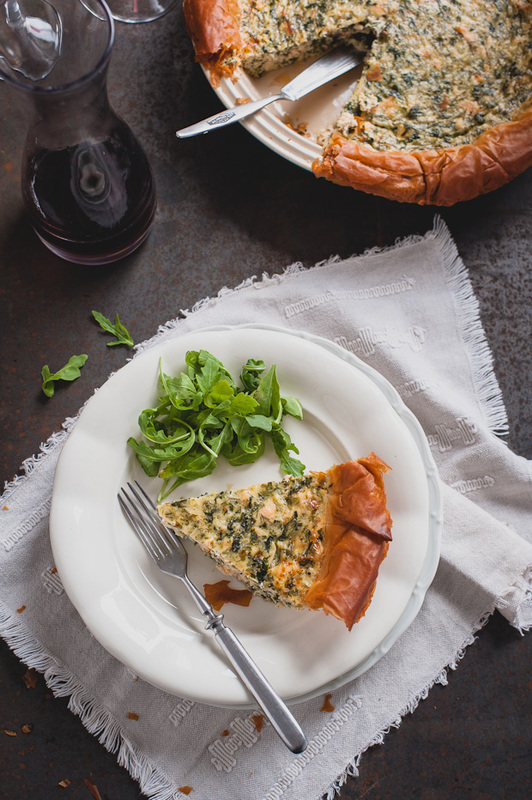 Served with fresh greens and a glass of wine, it's the perfect picnic or garden party food. I decided to use phyllo pastry instead of a traditional pie crust. Was it my laziness or curiosity? I can't quite remember. However, P. welcomed the experiment with great pleasure as he's not a big fan of pie crust. 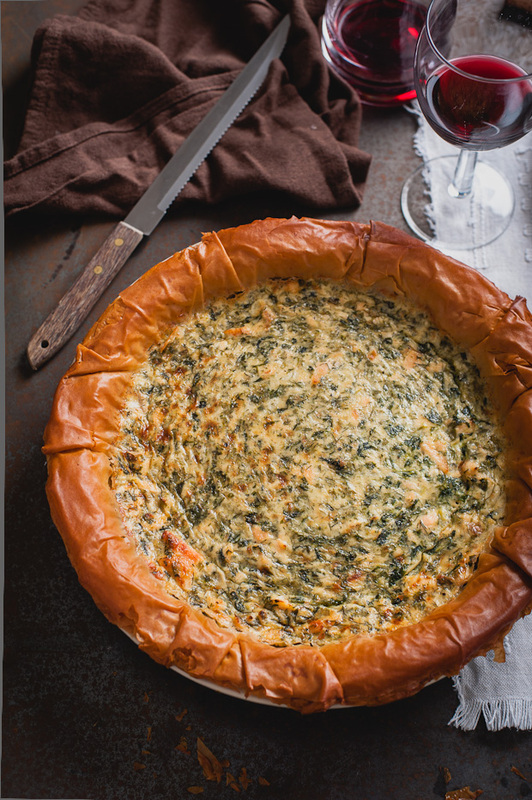 The purpose of phyllo pastry in this recipe is to hold the filling, rather than to be a part of the dish. Although I really liked the crisp edges. Using quark was another experiment which worked great. I love quark desserts, but I don't remember ever using quark to make a savoury dish. 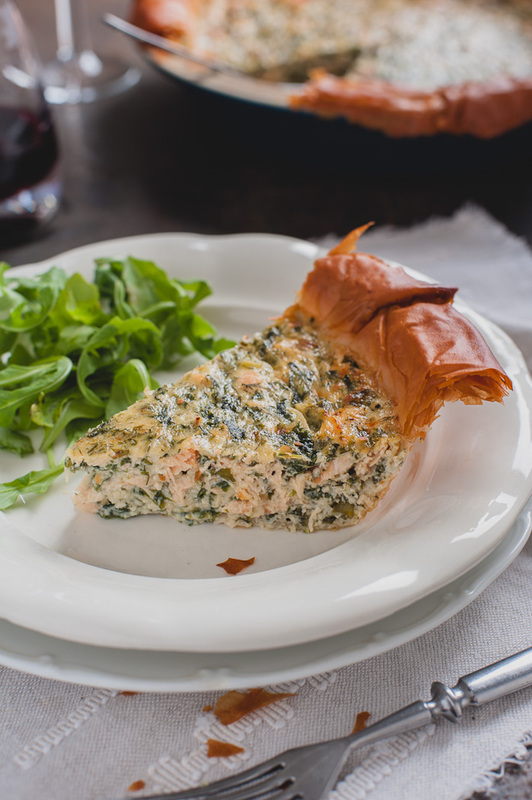 I used a lot of fresh herbs because I just love the flavour combination of salmon and dill. You can reduce the amount of dill or completely omit it if you don't like its taste. Also you can substitute spinach for kale or swiss chard. Update: If you can't find quark you can be substitute it for ricotta. Quark is a European type of fresh cheese made from soured milk. It has a very soft and smooth texture with a lovely tangy taste. In the UK, quark can be found in almost any Polish shop/deli or in the international section of major supermarkets. Put the spinach in a pan and cook for 1-2 minutes, until wilted. Take the pan off the heat and squeeze out all the liquid. Finally chop the spinach and set aside. Melt the butter in a pan, add the onions and garlic and sauté for 2 minutes on medium heat, stirring often, until slightly softened but not browned. Set aside. In a medium bowl, whisk together the eggs and cream. Add the quark, parmesan, spinach, sautéed onions and garlic, herbs, salmon, nutmeg and gently stir to combine. Season with salt a pepper. Melt the butter in a saucepan. Lay one sheet of phyllo on a working surface and brush with the melted butter. Place another sheet of phyllo on top of the first sheet, brush with the melted butter. Repeat process until all phyllo sheets are used. Transfer the phyllo into a buttered pie dish and trim the edges to fit the pie dish. Pour in the filling and bake until the filling is set and the pastry is golden brown, about 35-40 minutes. Cool 10 minutes before slicing.